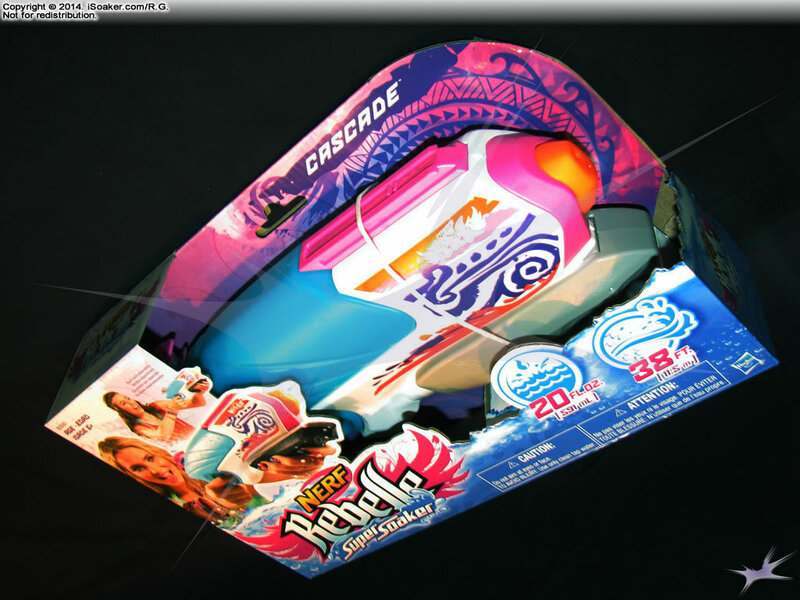 The Nerf Super Soaker Rebelle Wave Warrior is a new model by Hasbro Inc. for the 2015 Nerf Super Soaker line. 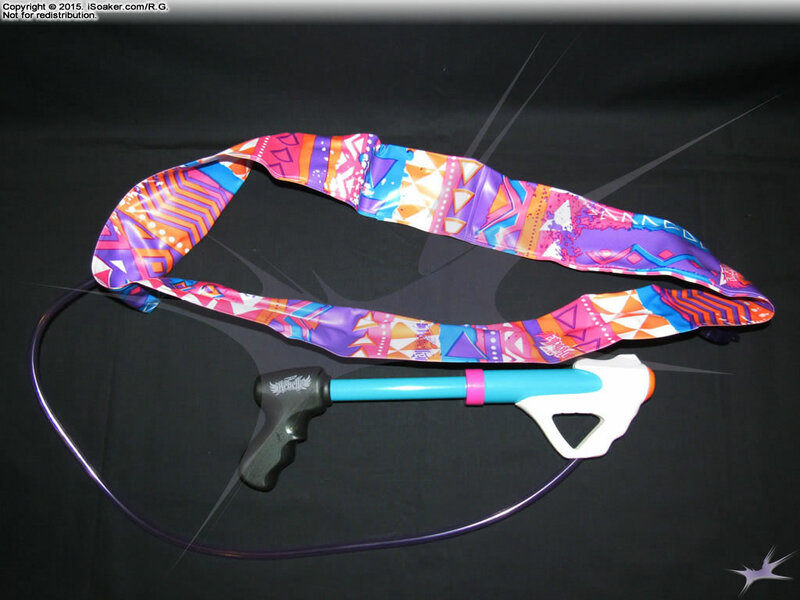 Featuring an over-the-shoulder bandolier reservoir and a syringe-type water blaster component, the Water Warrior is a unique twist on a backpack-type water blaster. 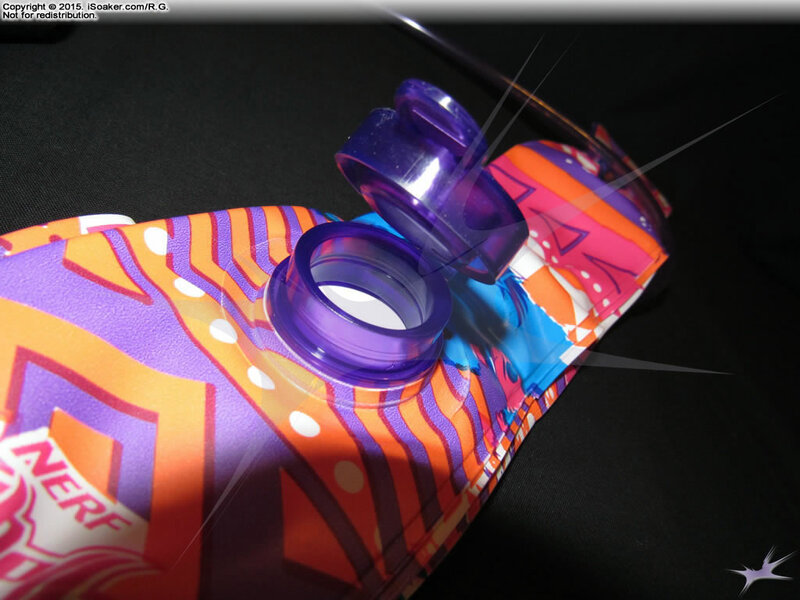 The Nerf Super Soaker Rebelle Wave Warrior features a surprisingly large nozzle on the relatively small-sized blaster component to this item. Powered by User-strength piston force, this nozzle can unleash a fairly sizable stream. 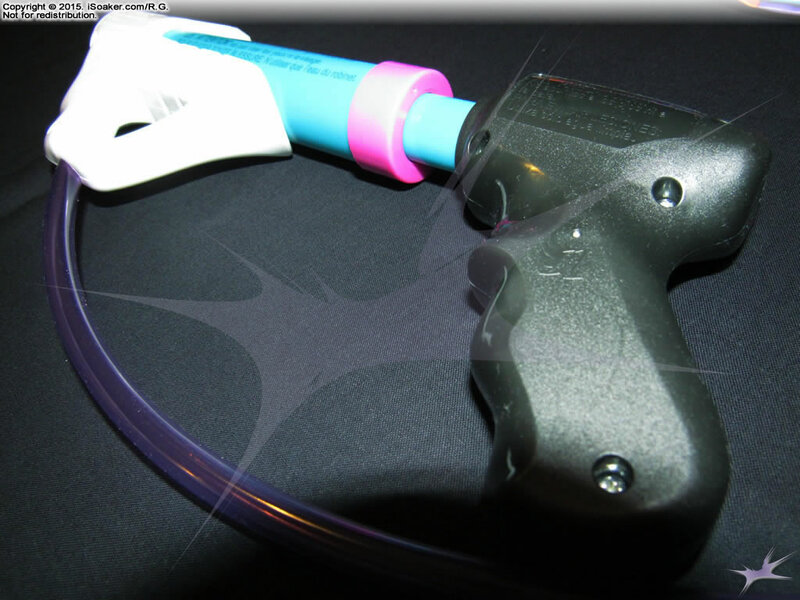 Being a standard pump-action water blaster, the Wave Warrior is unable to produce a continuous stream. However, being able to push roughly 50mL (~1.7oz) with every shot is quite respectable. 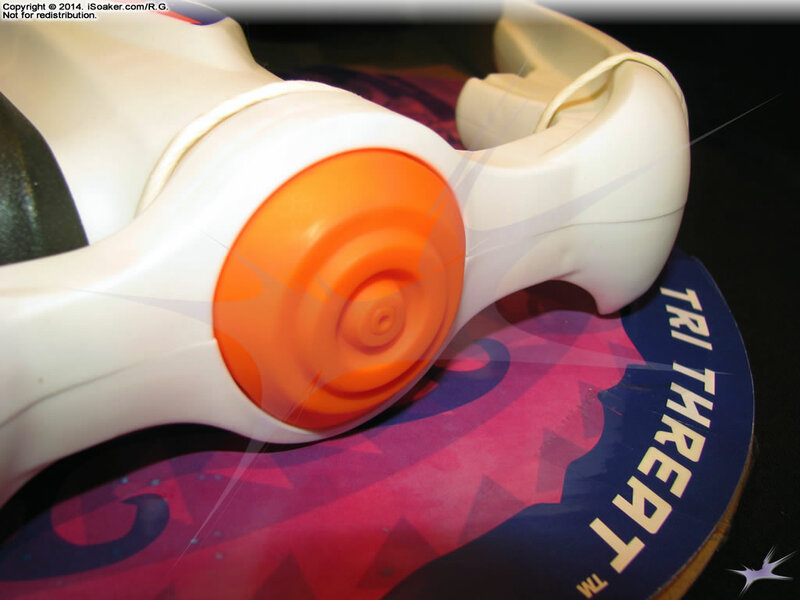 The rear grip for the Nerf Super Soaker Rebelle Wave Warrior feels comfortable to hold and is of a standard size. The forward pump grip, on the other hand, feels short. The hole in the forward grip does allow one to thread either one's finger or thumb through it, allowing one to hold the pump more securely, but the overall shape of the forward grip leaves larger hands uncertain of how best to hold this grip. Drawing water and blasting from a full reservoir works well and the pump performs smoothly. However, when water supply is running low, the intake tubing for the pump can end up sealing against the opposite wall of the reservoir, preventing more water from getting to the pump. While not a problem directly associated with the pump, it is being mentioned since it can affect pumping. As noted above, the rear and forward grips of the Nerf Super Soaker Rebelle Wave Warrior are ok, though the forward grip does feel somewhat small for adult hands. There is a light texturing on the rear grip, making it more secure to hold even when one's hands are wet. The reservoir of the Nerf Super Soaker Rebelle Wave Warrior is, perhaps, the most unique aspect of this water blaster. Designed as an over-the-shoulder bandolier, this soft, vinyl-like reservoir is initially rather floppy and compact when initially removed from the packaging. The walls of the reservoir appear to be initially semi-stuck to each other from being folded in the box, making it difficult at first to actually get water into it. The reservoir cap is made of a semi-soft plastic that requires a little work to open, but feels fairly watertight. The soft shell, long nature of the reservoir makes it rather difficult to fill from a standard sink and faucet. Some may have better luck attempting to fill from a hose, but with no clear place to hold the bandolier when filling, one needs to keep the reservoir opening on the top, allowing the rest to drape down and fill. This is easier said than done. Moreover, as the reservoir fills with water, it expands, but then one must be careful not to accidentally squeeze the reservoir while filling, otherwise water will be squeezed out of the fillport. Anyone who thinks it would be a good idea to fill this while wearing it is more-than-welcome to soak themselves; I, personally, would not recommend filling when wearing. Thankfully, the reservoir cap does appear to do a good job at sealing the fill-port. Now, I cannot speak for others, but I typically fill my water blasters using the cold water setting (not necessarily ice-cold, but simply whatever water tends to come out of the faucet using only the cold setting). Draping a bandolier filled with significantly-below-body-temperature water over a standard spring/summer shirt is mildly shocking. Sure, the weight distribution feels good, but the coldness of the vinyl material does not. I should also note that a User must pay attention to when he/she is putting the bandolier on to ensure one does not get tangled in the Wave Warrior's blaster tubing. Once on, the Wave Warrior's bandolier reservoir does its job decently with the opening for the blaster intake being close to the lowest point of the reservoir. Additionally, as water is drawn from the reservoir, the bandolier shrinks a bit. Weight distribution is good, but having an item attached to a hose draped over one's torso can feel somewhat restricting as well. As a whole, the Nerf Super Soaker Rebelle Wave Warrior offers a decent performing piston-based blaster portion with an awkward to fill and potentially chilling-when-used bandolier-type reservoir. The stream performance of the Wave Warrior is good, but the challenge of filling and donning of the reservoir together with the fact it can clog itself when water levels get low is somewhat dissapointing. The Nerf Super Soaker Rebelle Wave Warrior can keep space with most other small-calibre water blasters, but the act of filling and wearing the reservoir may get one already somewhat wet - User beware. Pump-action reduces ability to aim while shooting; bandolier-type reservoir awkward to fill and put on; cold water in bandolier-type reservoir will chill the User (filling with warm water highly recommended).